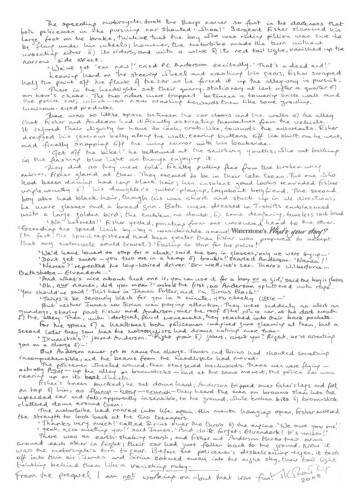 In early 2008, Harry Potter author J.K. Rowling wrote an 800-word prequel story — the only ‘Potter prequel’ she’ll ever pen. 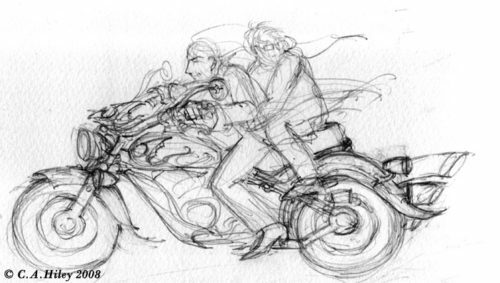 The prequel, set three years before Harry’s birth, tells the story of James Potter and Sirius Black, an enchanted motorbike (sound familiar? ), and an altercation with Muggle policemen. Rowling wrote the story for Waterstone’s “What’s Your Story” project — a collection of storycards which were auctioned for the English PEN and Dyslexia Action charities. Rowling’s handwritten contribution fetched £25,000 at auction, and was also shared online. Read on for a transcript of the story. The speeding motorcycle took the sharp corner so fast in the darkness that both policemen in the pursuing car shouted ‘whoa!’ Sergeant Fisher slammed his large foot on the brake, thinking that the boy who was riding pillion was sure to be flump under his wheels; however, the motorbike made the turn without unseating either of its riders, and with a wink of its red tail light, vanished up the narrow side street. There in the headlights sat their quarry, stationary at last after a quarter of an hour’s chase. The two riders were trapped between a towering brick wall and the police car, which was now crawling towards them like some growling, luminous-eyed predator. They did as they were told. Finally pulling free from the broken wing mirror, Fisher glared at them. They seemed to be in their late teens. The one who had been driving had long black hair; his insolent good looks reminded Fisher unpleasantly of his daughter’s guitar playing, layabout boyfriend. The second boy also had black hair, though his was short and stuck up in all directions; he wore glasses and a broad grin. Both were dressed in T-shirts emblazoned with a large golden bird; the emblem, no doubt, of some deafening, tuneless rock band. ‘Oh, our names, did you mean?’ asked the first, as Anderson spluttered with rage. But Anderson never got to name the charge. James and Sirius had shouted something incomprehensible, and the beams from the headlights had moved. The policemen wheeled around, then staggered backwards. Three men were flying — actually flying — up the alley on broomsticks — and at the same moment, the police car was rearing up on its back wheels. Fisher’s knees buckled; he sat down hard; Anderson tripped over Fisher’s legs and fell on top of him, as flump — bump — crunch — they heard the men on broomsticks slam into the upended car and fall, apparently insensible, to the ground, while broken bits of broomstick clattered down around them. The motorbike had roared into life again. His mouth hanging open, Fisher mustered the strength to look back at the two teenagers. There was an earth-shaking crash, and Fisher and Anderson threw their arms around each other in fright; their car had just fallen back to the ground. Now it was the motorcycle’s turn to rear. Before the policemen’s disbelieving eyes, it took off into thin air: James and Sirius zoomed away into the night sky, their tail light twinkling behind them like a vanishing ruby. From the prequel I am not working on — but that was fun!